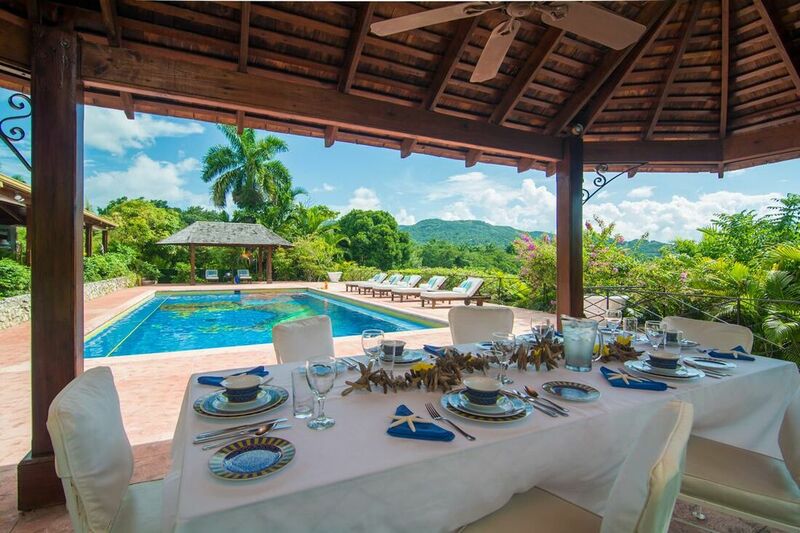 Knockando Villa at Round Hill is a delightful and luxury villa Jamaica located within the prestigious Round Hill Resort. 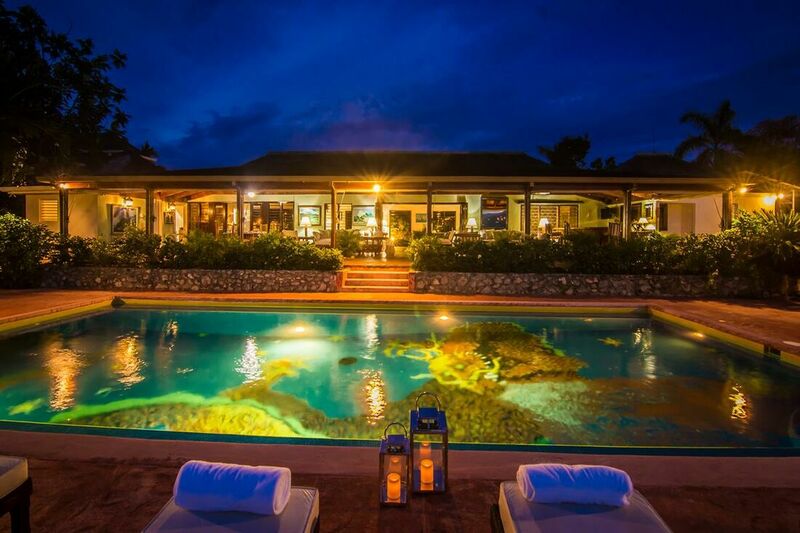 This property gives a true feeling of relaxing in luxury while in Jamaica, with contemporary comforts and amenities. 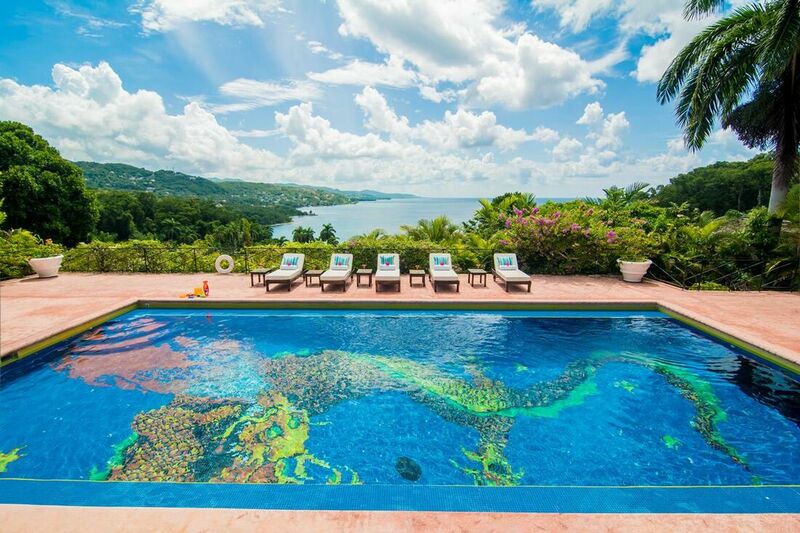 This is a very family friendly Jamaica villa and children are welcome. 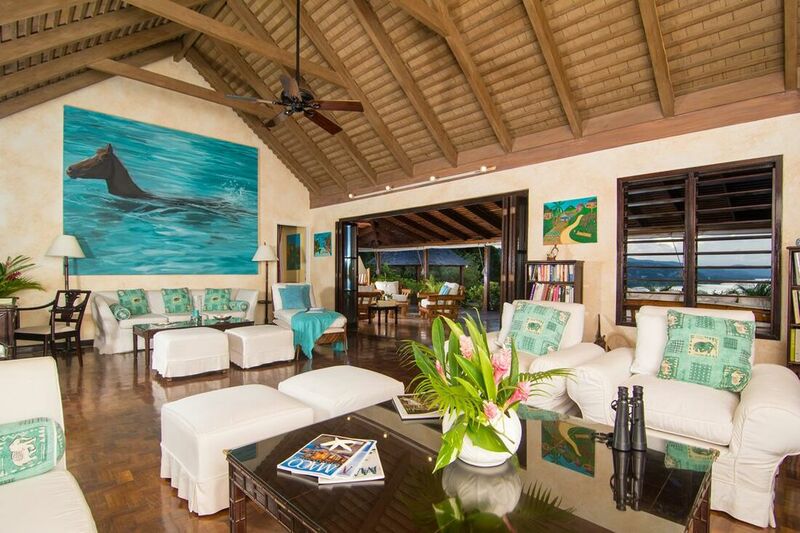 The expansive living room at Knockando Villa is equipped with cable TV, DVD and internet connection. This living room has parquet floors and opens wide to the central section of the house which leads to a 1,300 sq-ft veranda. 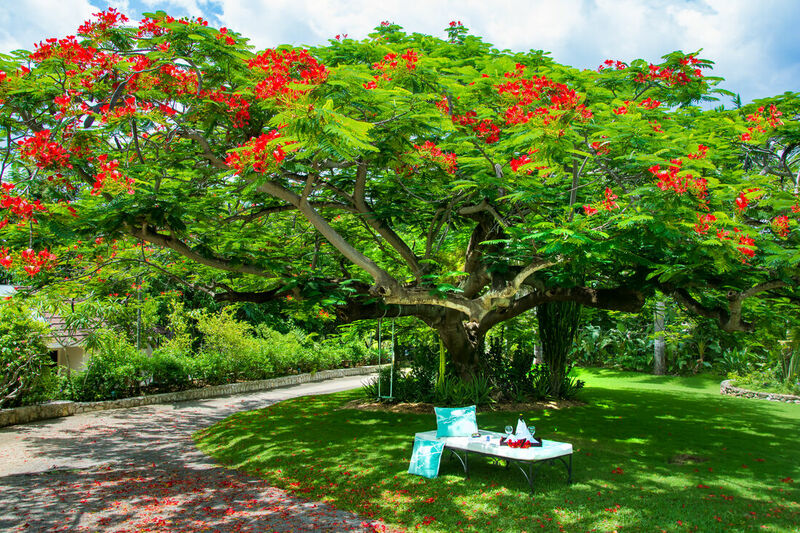 The complimentary feature Internet access for laptop users is available in all bedrooms, and including the Treetops, verandah and pool deck. Included for the guests’ entertainment is a DVD and cable televisions, news, sports, movies, family and children programs. A sound system is also located in the living room, dining room, verandah, exercise and pool area. There is an extensive library of CDs, DVDs and videos for both, parents and children. 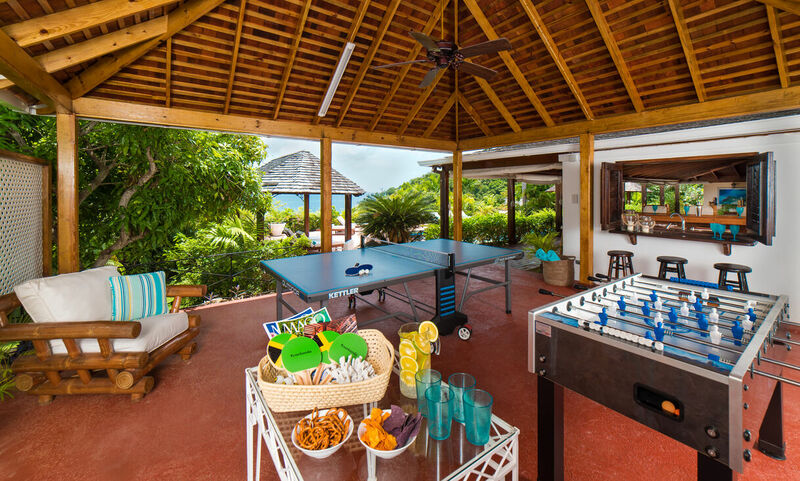 ** "New fiber optic internet cable throughout"
** "New game room with ping pong table and foosball table"
The veranda at the villa in Jamaica has the most comfortable and luxurious seating in white canvas on oversized bamboo sofas, and generous seating areas with chairs set under five ceiling fans. At the end of the verandah is a unique bamboo wet bar with ice maker, fridge and cable television. 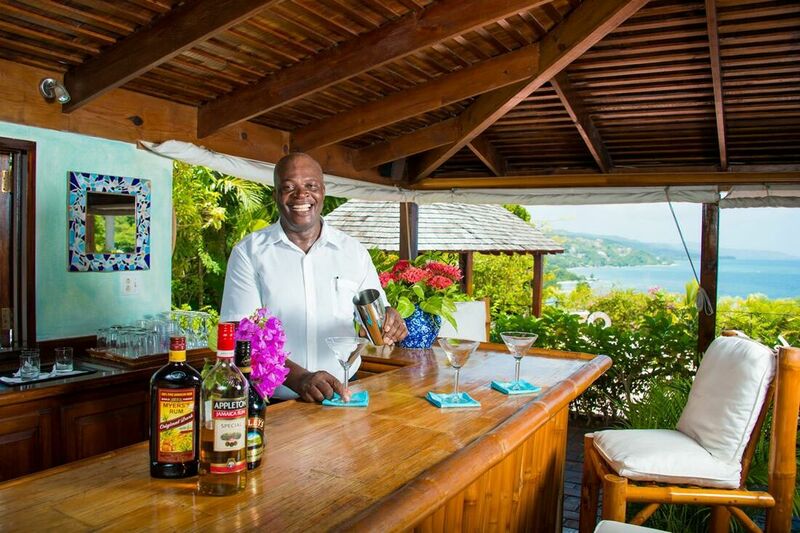 Guests can mix their own tropical drinks here, real Jamaican rum punch style! 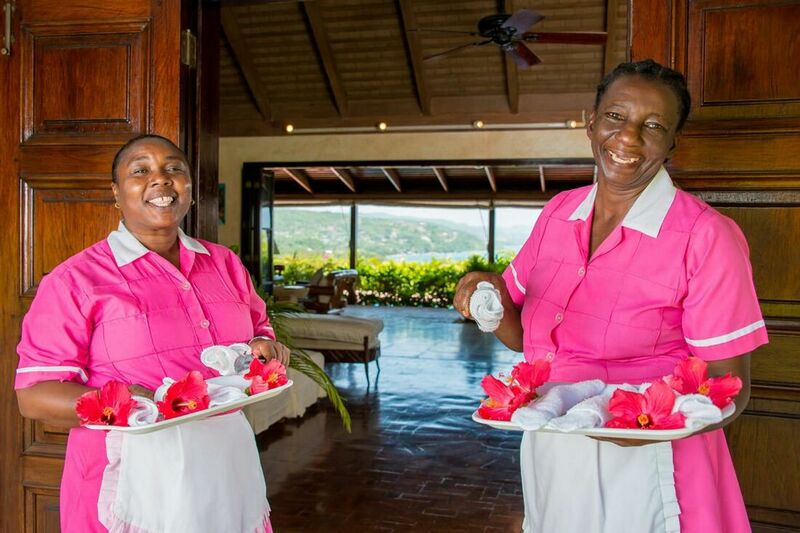 Guests are completely pampered at Knockando Villa by the very attentive staff of 5, including the cook, butler, housekeeper, laundress and gardeners. 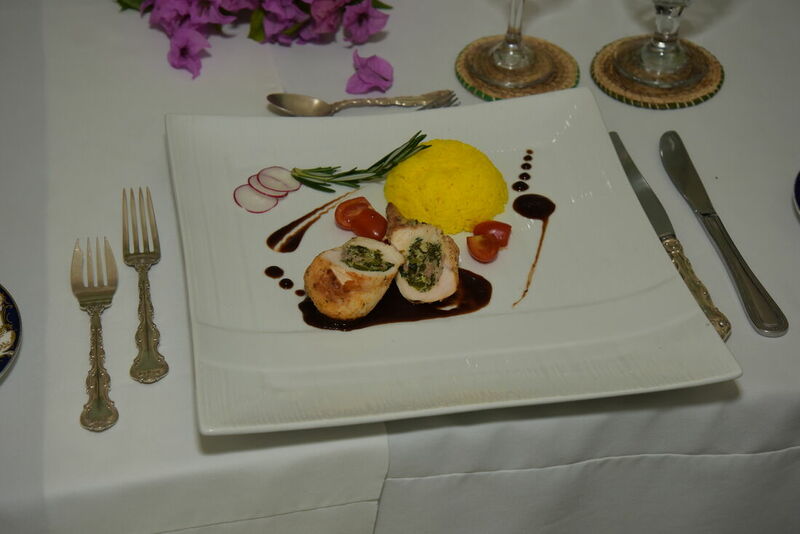 The cook is fantastic at preparing home-cooked meals. 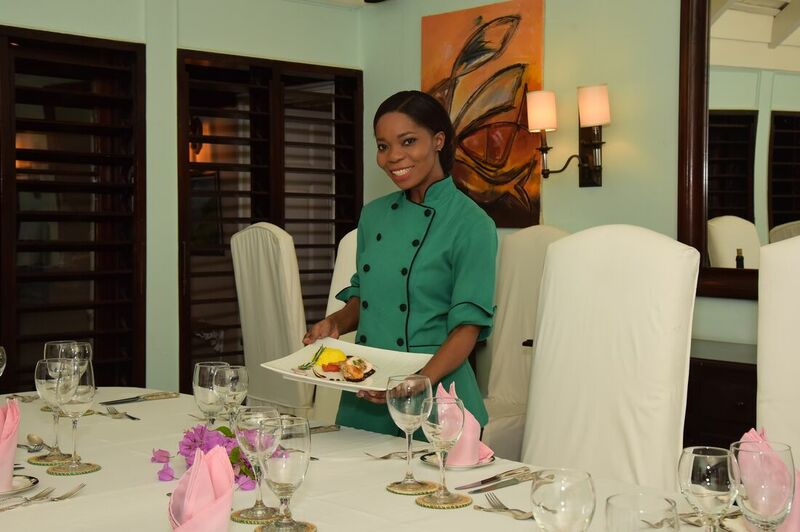 As the staff will take care of everything else, the guests simply have to focus on relaxing and enjoying themselves thoroughly. The very elegant indoor dining room is furnished with a 10' mahogany pedestal table set with Rosenthal, Minton or Royal Worcester china and sterling silver. 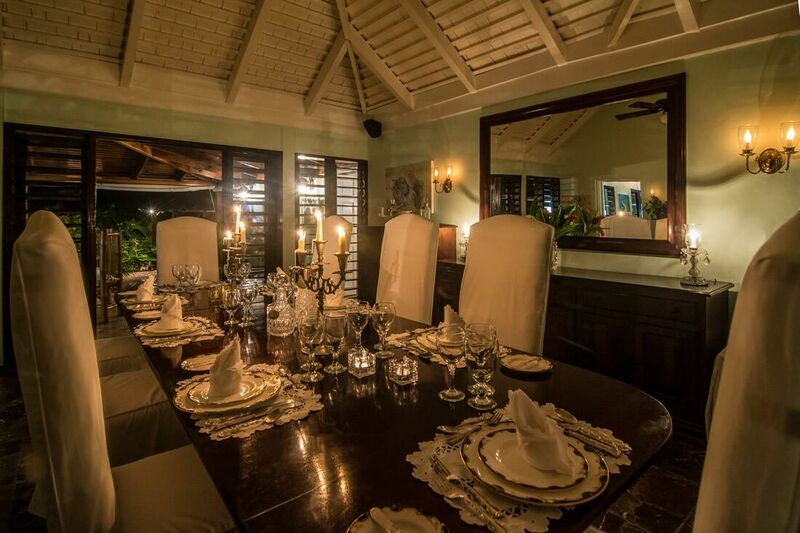 Meals can also be served on the veranda overlooking the spectacular coastline views of Montego Bay. Other options are available for dining areas. For outdoor entertaining, there is a deluxe Lynx grill for the cook to prepare the most delicious meals, with a choice of steak, pork chops, fish, chicken, lobster...a culinary delight! 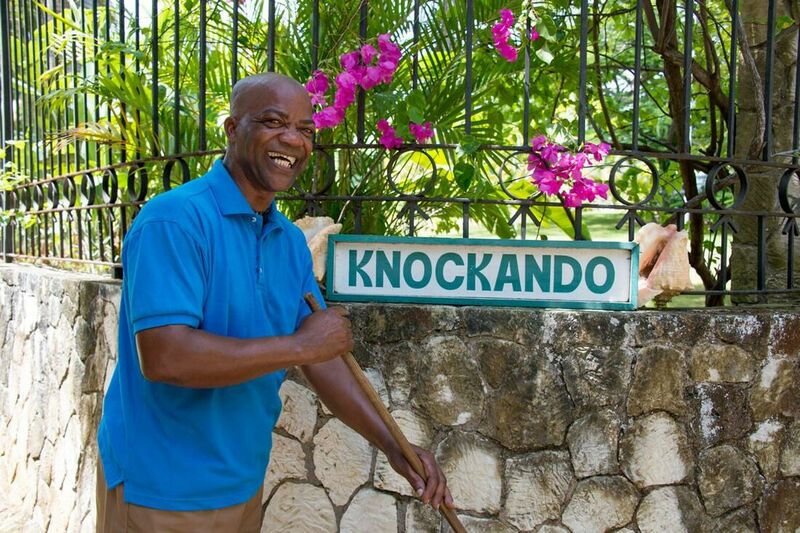 Knockando Villa is handicap accessible as it has a ramp for wheelchairs, and 3 handicap bathrooms and toilets. 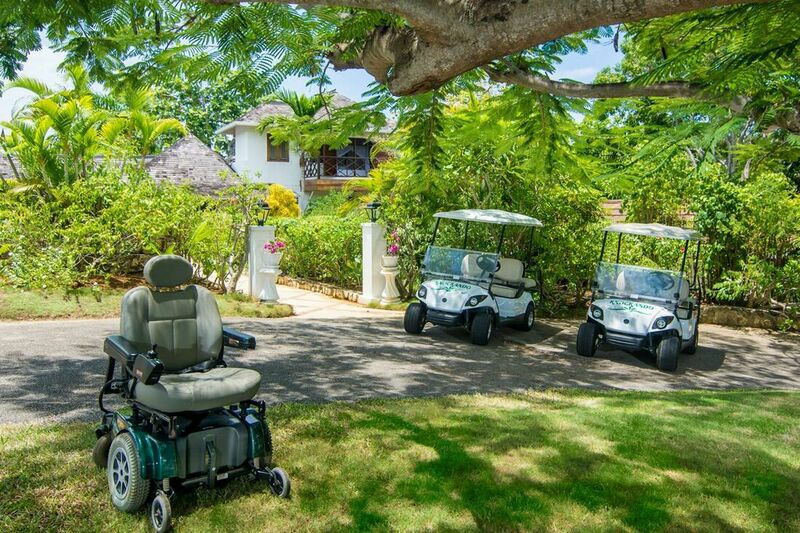 There is also an electric wheelchair (1122 Jazzy) and a Rascal electric transport cart which guests may use to transport themselves around Round Hill's resort and beach area. At the opposite end of the veranda is a wheelchair accessible bathroom, with a gentle ramp to the pool terrace. 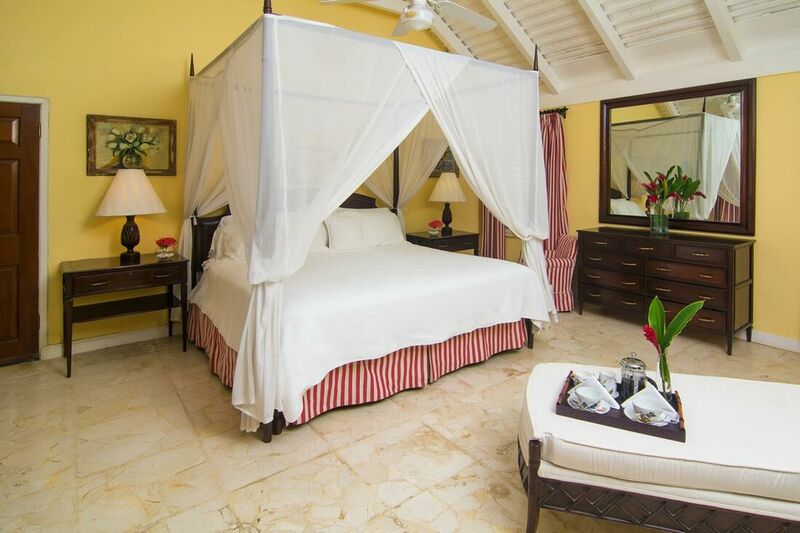 Accommodations at Knockando Villa - The fabulous Knockando Villa offers five bedroom accommodations. 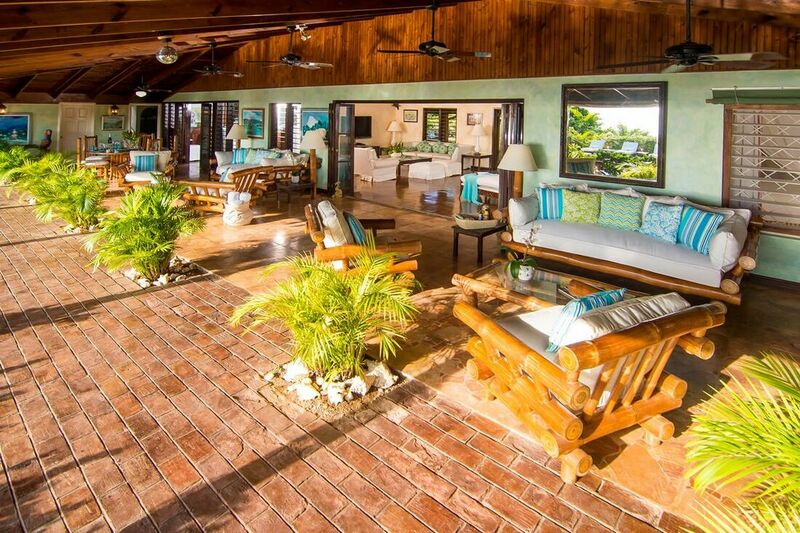 All bedrooms at this luxurious villa rental in Jamaica are air-conditioned. 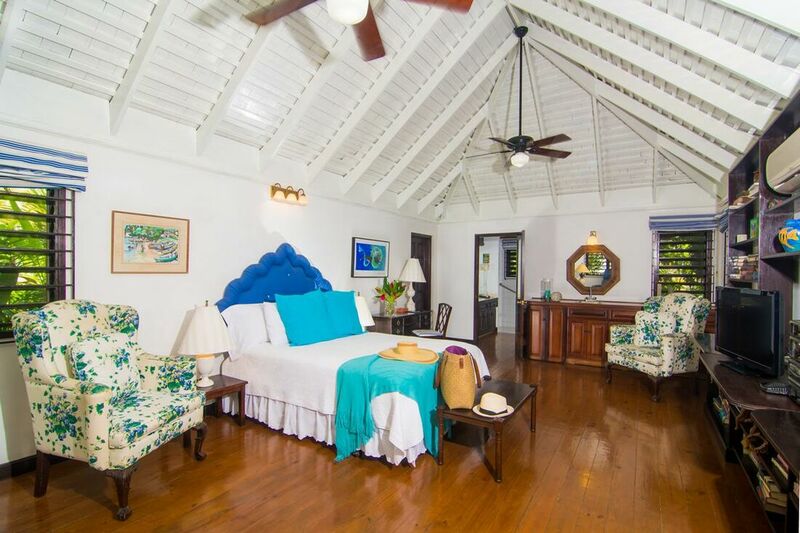 Master Bedroom is a large bedroom, approximately 650 sq feet. It has a large king-size bed, television, dressing room with a padded mahogany spindle crib, en-suite bathroom with bidet, large walk-in shower and sunken bathtub, which is big enough for two. 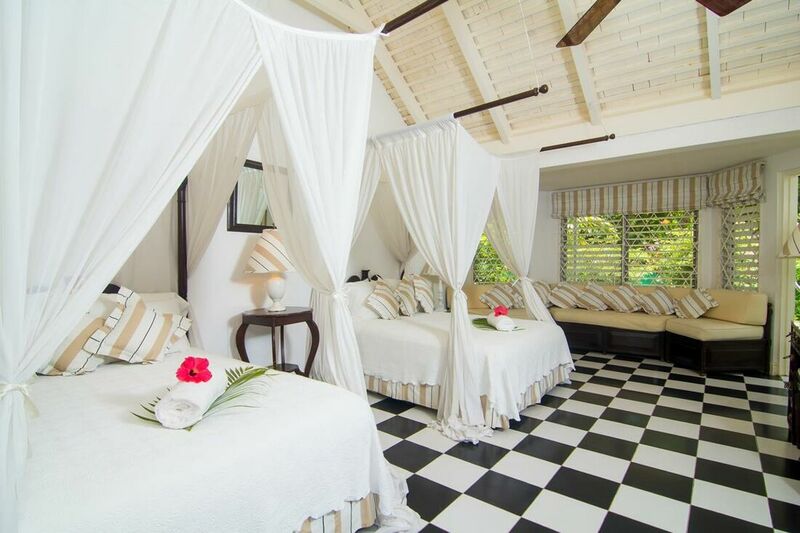 A lovely suite for you! This adjoins the Middle Bedroom. 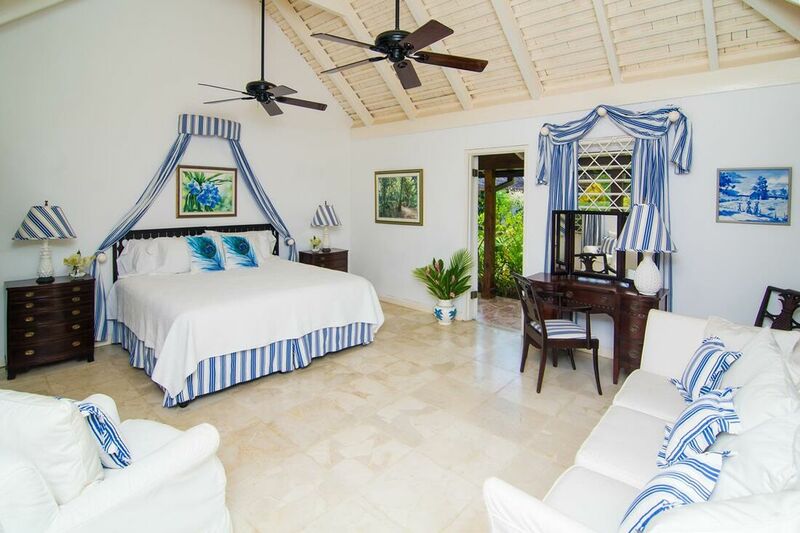 Middle Bedroom has an optional king-size or twin beds, television and en-suite bathroom with tub/shower combination. The dressing room has interior passage to the Master Bedroom via door that maybe left open or locked at night for privacy. Blue Room is a large room at 400 square feet. Amenities include optional king-size or twin beds, television, en suite bathroom with double-sink marble vanity and wheelchair accessible shower with bench, and 4 ceiling fans. An interior hallway leads to small room with one queen sized bed for child, nanny or another adult. Connecting doors may be left open or closed at night. 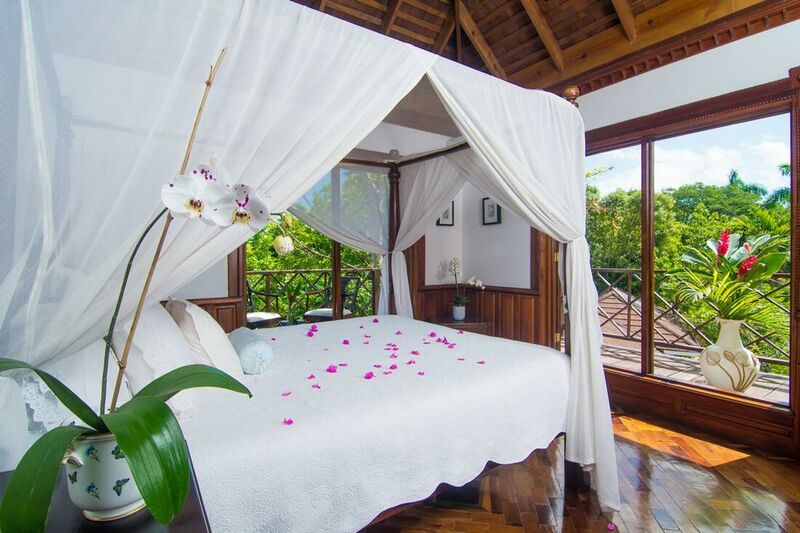 Treetops is a very romantic bedroom on the private upper level, with parquet floors, en suite bathroom with lovely open-air pink marble shower and sea views. There is a wrap-around wood plank balcony with gorgeous views on three sides. The Cottage is a room located in a free standing building across the lawn and is about 400 sq feet. It is within close walking distance to the main house. There is a queen-size bed, television, DVD, sound system, desk, wet bar and fridge. There are lovely wooden floors and book shelves. The en suite bathroom has a booster toilet with side rails, and is wheelchair accessible with shower and bench, Jacuzzi bathtub. This is an excellent handicap accommodation with all the comforts of home. 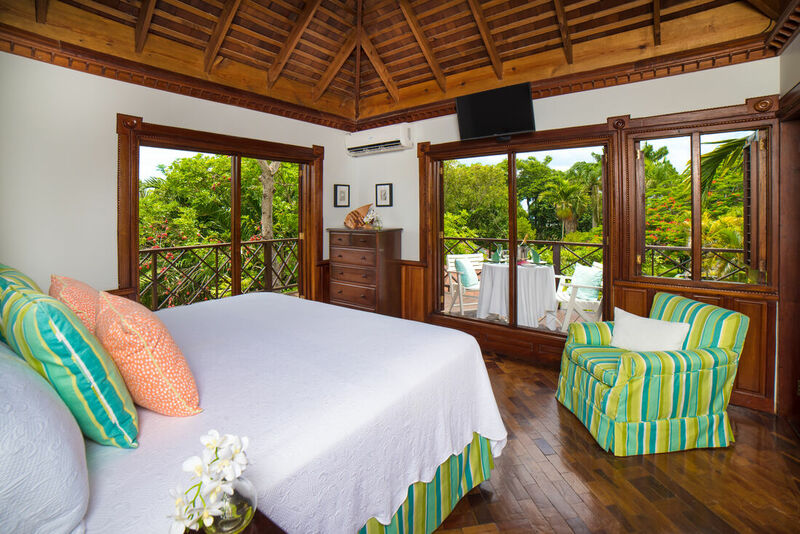 Olivia's Tree House is a lovely room located down one flight of stairs, and is directly under the Treetops room. This makes a lovely upstairs and downstairs accommodation for parents and children or families traveling together. 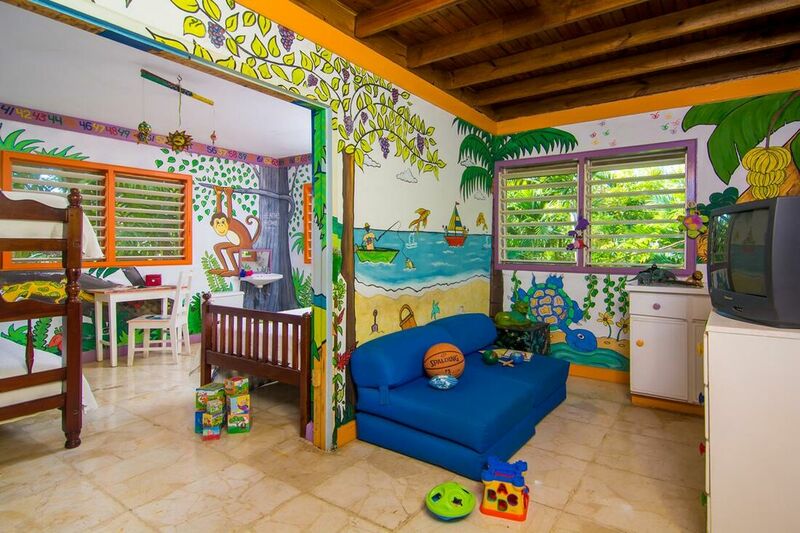 There is a colorful play room, which also acts as a bedroom for kids. There are bunk beds with safety side rails, trundle beds for two or more children. There is a television and DVD, children's videos, stuffed animals, lots of toys and games, blackboard and a little sink and toilet. This is such a perfect room for kids; they will not want to leave. 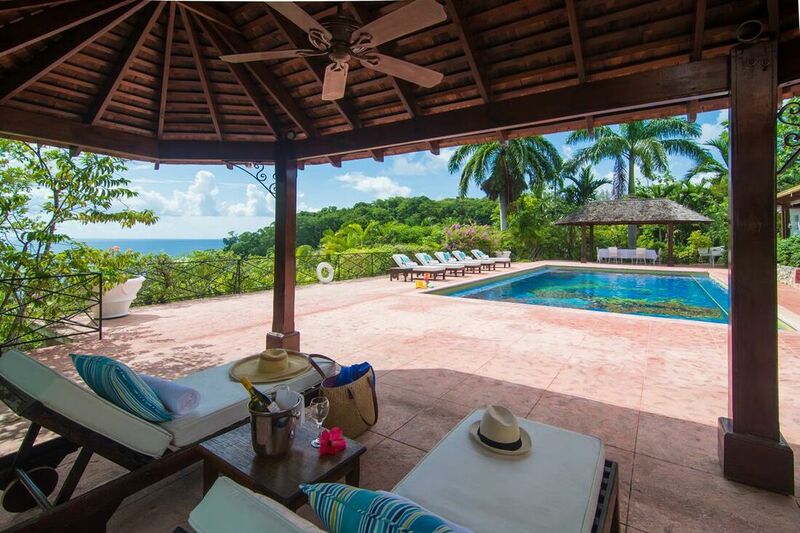 This entire property is child friendly and there are also baby gates to limit unsupervised access to the pool area. All guests have a complimentary membership the facilities at the prestigious Round Hill. 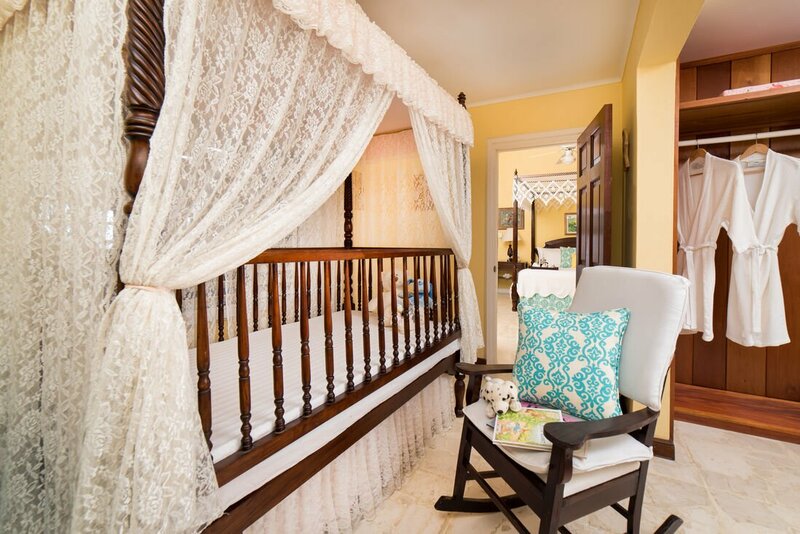 The house is extremely child friendly with a full sized crib in the bedroom attached to the master bedroom, a stroller, high chair, and railings that can slide into place to block out the entrances from the verandah to the pool. Max amount of guests is 14 if reserving the entire villa! 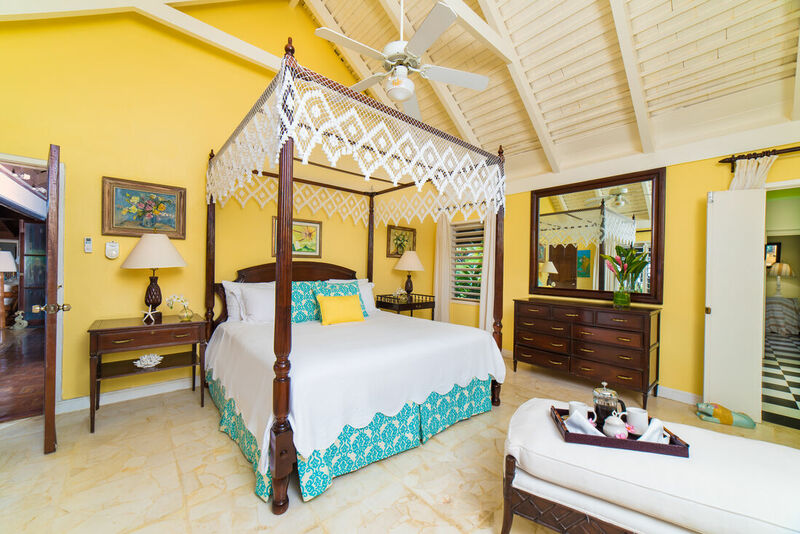 A special amenity available to our guests in this villa is membership at legendary Round Hill, one of the finest private resorts on Jamaica's North Coast. Membership entitles guests to access Round Hill's private beach and tennis courts, lit for night play and with pro on call. (Charges apply to lessons and ball boys.) 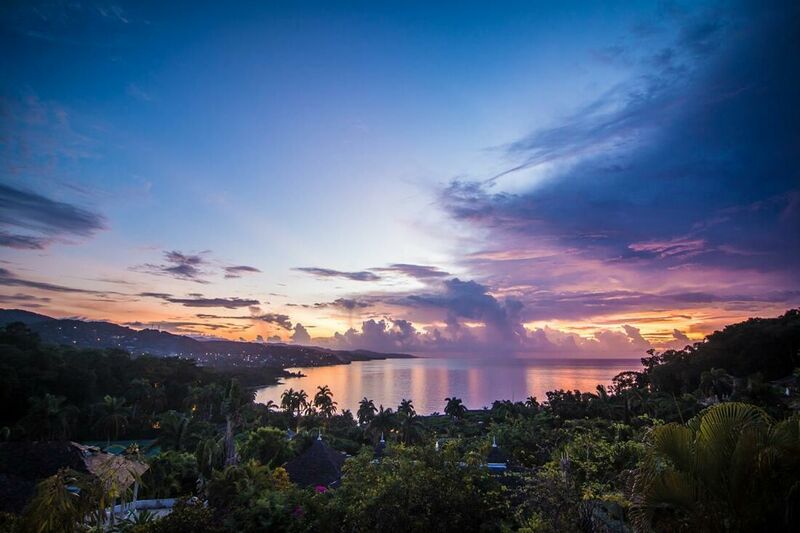 As members, you are also invited to enjoy the Manager's Cocktail Party, jogging trail, gift shop, logo shop, beach bar, Ralph Lauren-designed piano bar, Jamaican and Continental cuisine in the hotel restaurant ... and unforgettable long sunsets from the waterfront terrace. 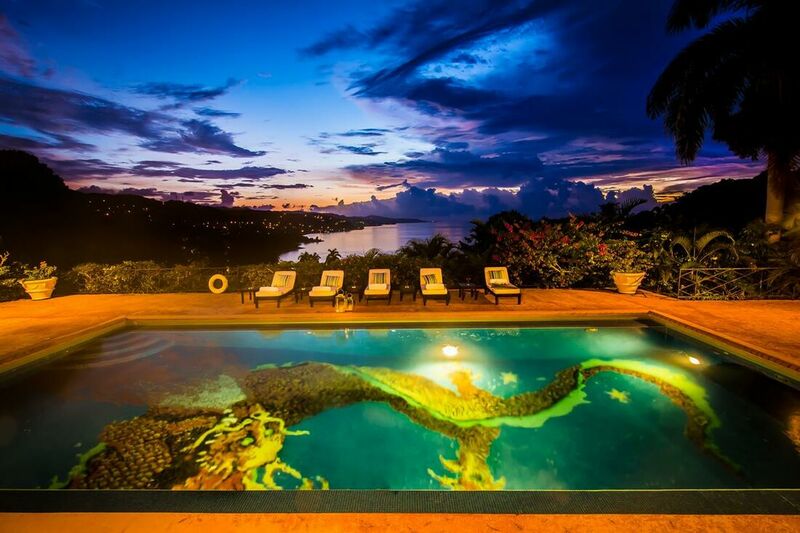 For additional charges, members may enjoy the spa, Pineapple Kids Club, fitness center, parties (Monday night beach party and Friday Jamaica Night) and a range of water sports. Please know that services are at a cost and can be paid directly to Round Hill. SWIMMING POOL SIZE: The measurements are 40 feet by 20 feet and it goes from 46 inches deep to 81 inches deep. Master - 3 actual rooms, King bedroom, dressing room with crib, bathroom. NOTE: The interior passage from the master to the middle is locked and completely private. It is left open only if requested by parents with small children in the middle room. 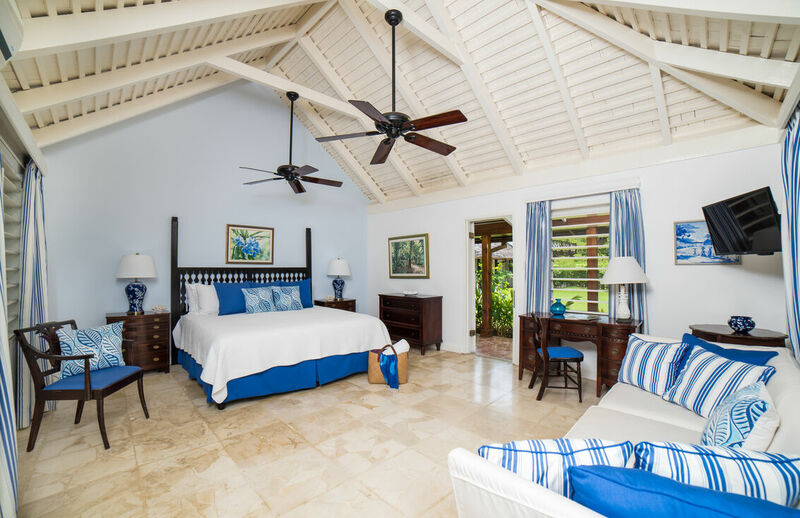 All bedrooms have their own private entrances. 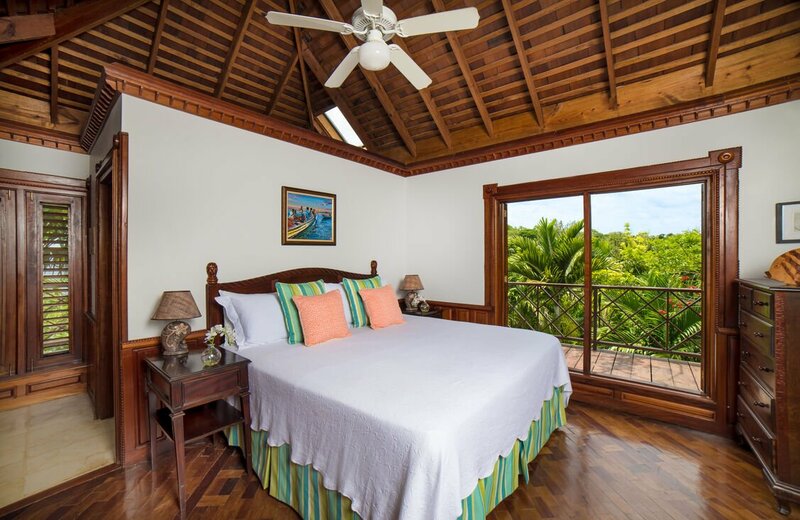 All bedrooms are completely private. If the small back room of the blue room is used then that room becomes semi private. We comfortably sleep 5 couples in complete privacy. Olivia's Tree house - 1 set of bunk beds, 1 twin bed, 1 trundle bed; small child-sized toilet and sink in the room. 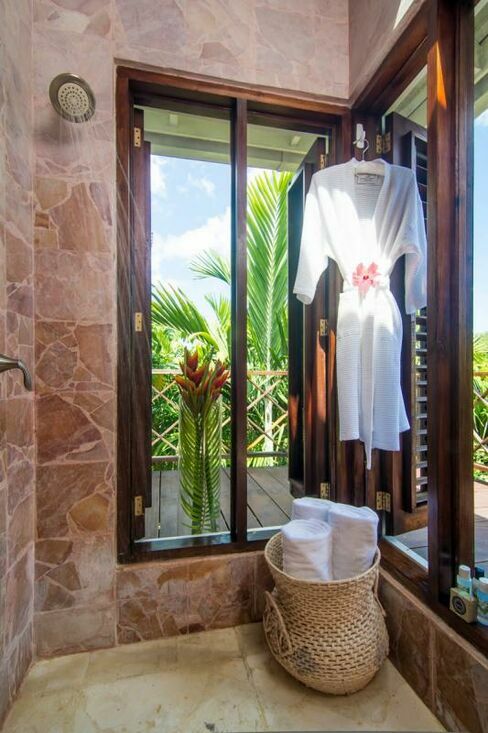 There is also a full bathroom with shower located on the verandah. There is also an outdoor shower located on the pool deck. Nanny service is available at Round Hill for a cost.